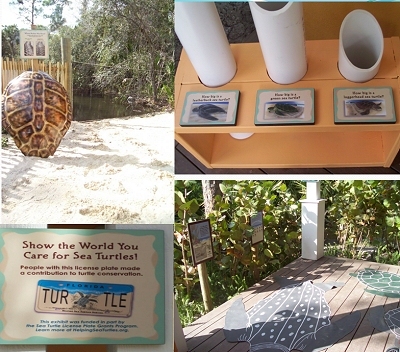 Summary: Turtle Beach is a developmentally-appropriate sea turtle exhibit scheduled to open at Brevard Zoo in 2008 as part of a marine-themed outdoor education area. The exhibit will annually teach over 300,000 zoo visitors about sea turtle nesting behavior and about how to be good neighbor to turtles. Turtle Beach differs from most passive exhibits by encouraging children and their caregivers to take on the personas of sea turtles and researchers. Everyone gets to dig a nest, scramble down to the sea, and track a turtle. The 600+ sq ft exhibit features a stretch of nesting beach from surf to dune and a multitude of props for dramatic play. It also includes the façade and front porch of a beach front house that demonstrates turtle-friendly design. Results: Exhibit construction is complete and the exhibit will open to the public on February 14, 2009. The Turtle Beach exhibit includes a sand play area where children wear turtle shells and act out the life cycle of a sea turtle, “fresh” sea turtle tracks in the sand every day for children to identify, a “porch” where parents can see sea turtle “friendly” features on a model beachfront house and find a variety of children’s books about sea turtle to read to their children, illustrated signage which describes the life cycle of a sea turtle using rich illustrations, and the Sea Turtle license plate acknowledgement signage. Preliminary results show of the evaluation show that 93% of respondents are “very satisfied” with their exhibit experience, 88% of respondents feel this exhibit is “better” or “much better” than other children’s exhibit they have been visited. Results also indicated that 1 in every 5 respondents has been to the exhibit more than 10 times and that 40% of respondents learned actions to protect the lagoon and natural areas.